The first house at Tatton Park was built in around 1520 for Sir Richard Brereton. Sir Thomas Egerton, who later became Lord Chancellor, bought the Elizabethan hall in 1598. During the 18th century a new house was designed and built by Samuel Wyatt for the estate, though the old house still remains. Over the years the Egerton family built up important collections of paintings, ceramics, furniture and books. 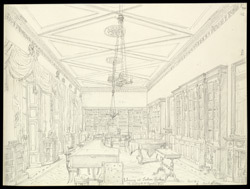 The library was built to dominate the redesign of the house and was most certainly intended for serious use. It houses one of the largest and most ecelectic collections for a private library of its time and includes musical scores, classical antiquities and important works, many of them first editions, dating back to the 16th century.